Center a closed segment Ring. ASAP!! Slippage of segmented rings during gluing is perhaps the biggest problem most segmenters experience. But once you've centered a closed-segment ring using the Longworth Centering Attachment, added glue and stomped the plunger, the ring won't slide. How large of closed segment ring can it handle? Fully opened, a ring of approximately 12" diameter can be placed within the sliding hex-head bolts. However, you can also rotate the disks so that the sliding hex-head bolts expand to center a larger segmented ring from the inside diameter. This allows you to center a ring that is 13"-14" outside diameter. Can I make my own Stomper? The centering holes of the Longworth Centering Attachment are approximately 13/16" in diameter. As long as the plunger system you make has a diameter between 3/4" and 13/16" it will work with this attachment. I've used a Longworth Chuck mounted on my lathe for years. 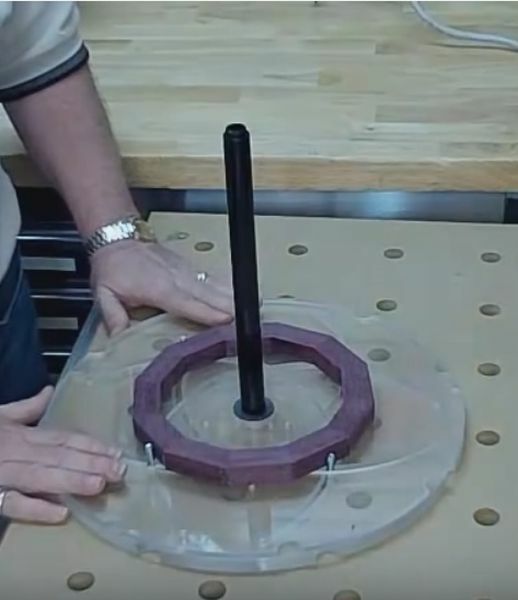 Using it to center segmented vessel rings is brilliantly simple. Why the name Longworth Centering Attachment? The Longworth chuck was developed by Leslie Douglas Longworth of the Hunter Valley Woodturners in Australia in the late 1980s. By adapting it so that it could be used with the Stomper, it is a self centering mechanism that easily and quickly adjusts to the size of your closed segment ring. This is done by using a pair of disks which rotate against each other, drawing in and out a hex-head nut on a series of opposing arcs. The speed and accuracy of this centering solution seemed to me to be the perfect answer for centering segmented rings around a plunger since the disks themselves are perfectly centered by the Stomper. Longworth Cenering Attachment, CLICK HERE.